Her name is Wounda, a chimpanzee that was rescued by Dr. Jane Goodall as she was on the brink of death. Wounda Means “close to dying” and that’s exactly how they found her. 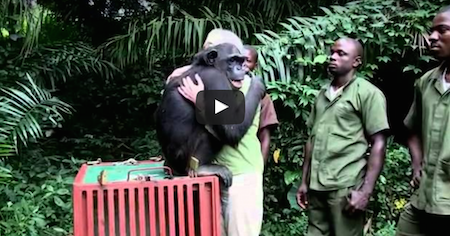 The rescuers helped her recover and regain her strength in preparation to be released back into the jungle. After being taken to Tchindzoulou Island to be freed, Wounda just couldn’t help to do THIS special thing for Dr. Goodall. Check out the video below and share this wonderful moment with your friends! At First Glance It Looks Like A Cabin, But Inside Will Blow Your Mind! Woman Gets Her Groove On While She Thinks No One Is Watching, Then….